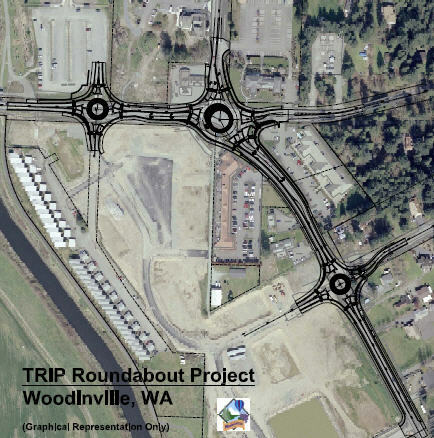 How many roundabouts can you fit into this single “traffic circle”? I am only asking because, apparently, there is some confusion here about the differences between a roundabout and a traffic circle. (You have to acknowledge: Alexandria’s South Traffic Circle is epic. The head of our local historic preservation non-profit recently suggested in The Town Talk that Alexandria apply to have its South Traffic Circle designated as historic; it’s the size of an entire neighborhood. That has to be rare, which is probably the main reason it’s so prone to accidents). Maybe it is just me, but there seems to be a huge difference between high-speed, massive traffic circles and low-speed, small-scale roundabouts. It seems a little disingenuous and intellectually dishonest to conflate the two. Prev Drew Ward: Just Do It Bobby! Call it what you want, high speed/low speed, traffic circle/roundabout… I doesn’t matter. It seems like a big libiality risk for acciednts. But, of course you boss who supports trial lawyers loves this idea. A simple traffic light would work just fine and if only one side at a time has a green light… no additional road or turn lanes will need to be built. No, it’s not just you Lamar. Recent work on approaches & new signage have helped a lot, but he dreaded South Circle’s biggest flaw is a posted speed limit that turns it into a circular raceway – and driver’s disregard for circle/roundabout etiquette of give and take. It seems most of us know about the “take” part, but forget the “give”. That, and too many wireless conversations going on. City and state planners have done their homework on the proposed Jackson/Horseshoe roundabout. Try as I may, I just see two circle’s..one big and one small. With the mentality of Central Louisiana drivers = CONFUSION. Cell phone in one hand .. beer can in the other, driving with knee. 4. Pedestrian/bike tunnels allowing non-vehicular traffic to bypass both the circle itself and the entry and exit lanes (makes it safe for pedestrians and ensures steady flow for cars). 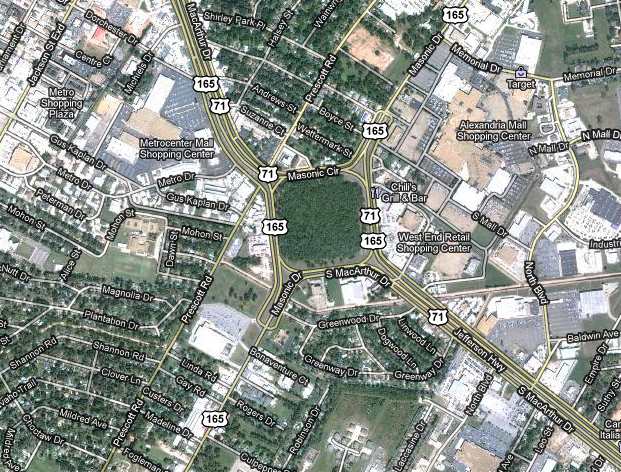 If done correctly, a roundabout is an ideal solution to not only Jackson ext but for several intersection in town. An incorrectly executed roundabout misssing any of these elements is either a traffic mess or an accident waiting to happen. The problem with the South circle (and even moreso with the old North circle) is that the need for higher speeds and lack of right-lane redirects prevents proper function. And as for bikes or pedestrians, forget about it. Do you feel there is a demand for bicycle/pedestrian traffic features in Alexandria? If so, is this demand even remotely in the same galaxy as the the cost is going to be for a bike/pedestrian “tunnel”? when installed ad part of initial constuction, such tunnels are extremely cheap as the dirt can be excavated (as it often is anyway for utilities) with a backhoe, the tunnel constructed of either brick, concrete, or even currugatef steel, and then dirt backfilled around it. It’s much easier and cheaper than going in later and tunneling under existing infrastructure. As for need, the areas off Lodi, Twin Bridges, and Horseshoe are major residential zones with the primary demographic of people likely to embrace walking and biking. Add to this the fact that ASH is right on the other side of this proposed roundabout and I’d say that yes, there is definitely enough need and interest to justify crossunders. Plus, spending a few bucks once to add that pedestrian component is cheaper than paying for crossing guards for the next 50 years. The other side of pedestrian components is to compare the other option — crosswalks on the entry and exit lanes. If you’re in a roundabout and exiting and someone crosses the roadway in front of you, you have to slam on your brakes and suddenly stop in a system that is not designed for stopping. Chances are the pedestrian will get across fine. But, with you stopping, the car behind you unexpectedly stopping, and the car behind it, and the car coming into the circle who’s not expecting to stop at all, how long is it before somebody gets rear ended? This is one case where preparing for pedestrian thoroughfares is not just for bikes and people, but a primary accident mitigation tool making the intersection safer for drivers. Okay, you made a compelling case for the initial construction costs. Do you have any data on the maintenance of these (I’m concerned they will fill up with water, or become infested with bugs, rodents and snakes, and become unusable) and particularly if the addition of these tunnels will decrease the expected lifespan of the roundabout itself. I still don’t see adults in the rural south, or even the suburban south biking or walking for transportation sufficient to justify any significant cost. For that matter, I suspect most ASH students will scoff at walking or biking more than 1/10 of a mile to school. However, if ANY do, and use the roundabout, the savings in crossing guards justifies the addition. Any extra use or benefit is laignappe. Maintenance shouldn’t be an issue. Most of my experience with these has been in parts of Germany and Poland that have almost identical soil / water table / and elevation conditions as Alexandria. These tunnels, like must below grade things will fill with water during flooding, but how often does that happen? A lot of times the surface structure can be raised a few feet (which actually helps with vehicle visibility). This of course helps limit water table issues. Beyond that, a sump pump is usually enough to take care of water from normal to heavy rains. Also surface ventilation and skylights usually tied into landscaping make tunnels safer and keep air inside fresh and dry. The maintenance should be no more than any other concrete structure as these are much simpler than say a car tunnel. As for structural integrity, having the cross-unders as a base should make fir a more solid rigid base for the surface structure than soil alone would. I grew up in Alexandria, although I have lived in San Antonio for many years. The South Traffic Circle on MacArthur Dr, (and the old North Circle) prejudiced me against smaller roundabouts, and when several were planned in San Antonio, I thought our planners were crazy, based on my MacArthur Dr. memories. There are three roundabouts on major streets in the older and more densely-peopled areas of the city, and I found that there is nothing to complain about. They work fine, and I don’t know of anybody who doesn’t like them. To see them on Google, go to the following three address in San Antonio, and go to the satellite view: (1) 600 E. Commerce St., in the downtown area; (2) 1700 Blanco Rd; and (3) 4300 McCullough Ave.